Camping is a highlight of the Cub Program. If you are an experienced camper, you know how meaningful it is to spend time outdoors with your kids. If the thought of sleeping in a tent has you backing away quietly, fear not! We will help you see the light! Please do reach out to your Den Leader or Pack leadership and let us guide you through your first camp-out. You don’t actually need much, and we may be able to assist you with gear. Tent, sleeping bag and pad rentals are also available at local stores (listed below). 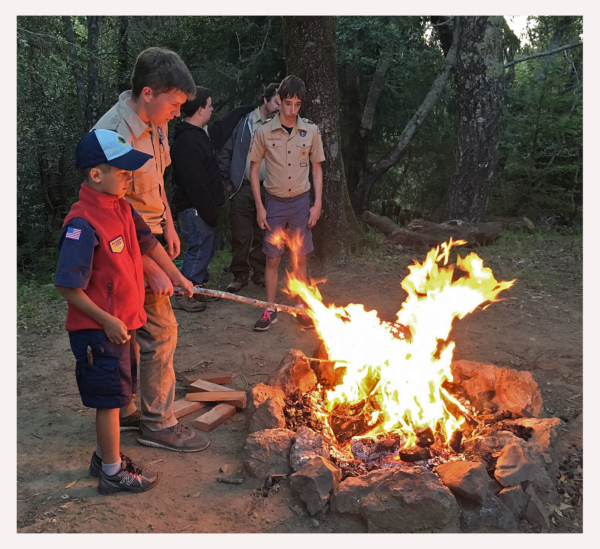 Our Pack participates in Council wide fall camping programs at Camp Tamarancho (Cub Adventurer and Tiger Cub Expedition), and Webelos attend Webelos Woods at Marin Sierra. These events are reserved for the Scout and their adult partner(s) only. In the Spring, the whole family may join in on Family Fiesta, where older Scouts from Scouts BSA and Venturing run programming for Cubs. Pack 76 also attempts a Pack camp-out during the year. In addition, we participate in a Pack overnight to a military ship or submarine, or to another unique location such as a museum sleepover. Camping at Tamarancho is car camping (your car is parked fairly close to your tent), and may or may not include cooking as a Pack, depending on Pack preference and fire danger. We will camp together as a Pack at one of the campground areas on site, but may share that area with other Packs as well. If cooking is planned, we’ll meal plan together in advance. There are pit toilets at the sites, and flush toilets in the main areas at Tamarancho. Water is available at the sites, but it’s good to bring extra. We do not typically have campfires at our sites, but will participate at the large campfire held on site for all Packs. Singing, skits and corny jokes abound! Tigers, Wolves and Bears only camp as part of the Pack, and Webelos / Arrow of Light Dens may camp without the Pack (but with adult supervision). Children may only be in a tent with their parent or adult partner per Scout rules. ¨Scouts start the day in their Class A uniforms. Most boys wear their Class B shirts on the following day. –UNPLUG!! Kids should not have electronics. Adults should also unplug as much as possible, and step away if they need to handle an emergent call, text or email. There are precious few opportunities to be away from phones and screens. Embrace them. -There is plenty of poison oak at Tamarancho. Look before you pitch your tent. Stay on paths. Long pants and long socks offer protection. Consider your shoes contaminated with poison oak oil. – Always pack for one season colder than it is. Layer your clothes. – NO scouts are allowed to have axes at any time, parents leave them at home as well! Bringing a extra canopy or tarp is always welcome!